“We do not know how much of the story about Department of Homeland Security’s request to interview Fonseka is real and how much may have been fabricated by Fonseka himself to score points against the Rajapaksas.” the US Embassy Colombo informed Washington. The Colombo Telegraph found the relevant leaked cable from the WikiLeak database. The cable recounts details of a meeting the US Ambassador has had with the Foreign Minister Bogollagama on November 2, 2009. The cable is classified as “CONFIDENTIAL” by the Deputy Chief of Mission Valerie C. Fowler. the Rajapaksas. Whatever the reality, the prospect of U.S. This man is a sick fellow,He fancied himself as a combination of Hannibal, Alexander, Julius Caesar, Napoleon and Rommel. In Sarath Fonseka’s self-perception he was Sri Lanka’s greatest military treasure and all glory was due to him alone. It was the “I, me., myself alone” syndrome. that is why all these are happening to him. more you write more raw garbage you spew. It was at Gotabhaya’s behest that Sarath Fonseka was made Army Chief. He was scheduled to retire as he would have reached the mandatory age 55 on December 6, 2005. But Gotabhaya persuaded his brother to make Sarath Army Chief because Fonseka was the best man to lead the army at that point of time. There was also Fonseka’s colossal arrogance. so SF was manipulating things, see what the US Ambassador says “We do not know how much of the story about Department of Homeland Security’s request to interview Fonseka is real and how much may have been fabricated by Fonseka himself to score points against the Rajapaksas”.shame on you Fonseka. What ever it is , time has come either to eliminate Fonseka from the face of earth or Release him and Get rid of his citizenry right to politics. Otherwise, send him and his wife away to their children, so world will know that we are not barbarians as Diasporas portraying us. But, Keeping him in Jails prove that those of who fabricating and assassinating his character are carpet Beggars. So, If you are thirsty for his blood. Kill him, wrap it in the so called white flag, and get rid of him. But, for the same of mother lanka, stop poking your finger to the wound as it is getting better. Suddenly, why is so important wiki leak or wiki lick. 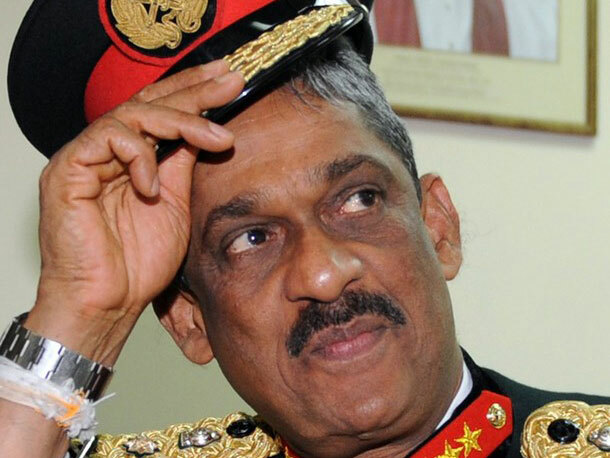 What is important is that arrogant, or not, Gen. Fonseka let our Army to victory against the Vicious Guerrilla Fighters in the world. Because I am one and seeing and knowing how my kind is, I know Sinhalese and specially Sinhalese, (no I do not spell singalese) I know we are good at forgetting things fast. General Fonseka won the Presidential Election which was rigged by the MR cronies to declare him the winner. How can he let the winning candidate live free? The way the General was arrested after the elections and the use of Kangaroo Courts to sentence him alone is ample proof. Sri Lanka is heading towards a dangerous family dictatorship. General Fonseka is a threat to MR & Co. Something should happen sooner not later to save our mother land. What a loser. Fonseka lost the whole world knows it. If the election was “rigged” (how exactly?) why didn’t Fonseka mention it in his petition to the Supreme Court?? He mentioned lots of other pointless waffle which he was more guilty of than anyone else but omitted anything about election rigging. Man is a liar and traitor with a giant ego. He has no honour or integrity. That is his flaw. He sacrificed the nation and the Army (bringing incredible damage to this illustrious institution that up to the point he opened his filthy mouth was respected the world over) because of his personality flaws: arrogance, ego and lust for power and wealth. What he gets he deserves. Hi there, I found your site by way of Google even as looking for a related subject, your web site got here up, it seems great. I have bookmarked to my favourites|added to my bookmarks. Hey there. I just want to firmly leave a nice swift commentary and let you recognize that I’ve been pursuing your page for quite some time. Keep up the tremendous efforts and I’m going to be checking back again relatively soon.